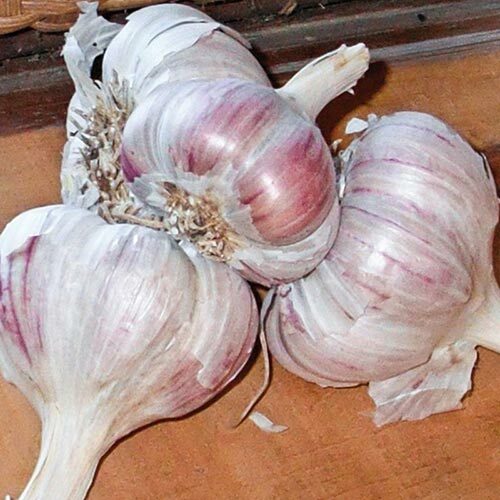 Inchelium Red Garlic | Gurney's Seed & Nursery Co. Discovered on an Indian reservation in Washington, this mid-season artichoke-type softneck variety is a national taste-test winner. With its pleasing rich flavor and medium pungency, it's not hard to see why it won the prize. Approx. 12-20 cloves per bulb. Spacing4 - 6 inches apart. FruitA bulb has approximately 12 - 20 cloves. CommentsDiscovered on an Indian reservation in Washington, this mid-season, artichoke-type variety is a national taste test winner. With its pleasing rich flavor and medium pungency, it's not hard to see why it won the prize. Very large cloves. White wrappers and cloves. Stores well for 6 - 9 months. SizeProduces bulbs typically over 2 1/2 inches in diameter. Depth1 - 2 inches deep.